Smith & Wesson reported strong results in its latest quarter. Gun sales have risen due to fears of tougher laws in the wake of the December shooting at an elementary school in Connecticut. Smith & Wesson said Tuesday that earnings more than tripled in its most recent quarter. The company also raised its outlook for gun sales this year. The nation's second biggest publicly traded gun company said it earned $17.5 million, or 26 cents per share, from continuing operations in the quarter that ended January 31. That's up from $5.4 million, or 8 cents per share, in the same period last year. Sales jumped 39% to $136.2 million, the company said. Smith & Wesson (SWHC) was expected to earn 23 cents per share on sales of $134 million, according to analysts surveyed by Thomson Reuters. The results followed a similarly strong quarterly report from gun maker Sturm Ruger (RGR) last week. Despite the better-than-expected earnings, shares of Smith & Wesson fell nearly 2% in extended trading. The stock has gained more than 21% this year. The results were driven by "continued robust consumer demand for firearms," said Smith & Wesson CEO James Debney, who singled out sales of the company's Military & Police pistols and "modern sporting rifles." Smith & Wesson said it expects to earn between 38 cents and 40 cents per share in the current quarter, and up to $1.19 per share for the full year. Analysts are predicting earnings of 30 cents for the quarter and $1.06 per share for the year. Sales for the full year are expected to total between $575 million and $580 million, Smith & Wesson said. Analysts were looking for $561 million. Smith & Wesson said it expanded production in the quarter and has been at maximum capacity for a year. "Despite these capacity increases, the company was unable to meet the ongoing demand across all of its firearm product lines," the company said in a press release. The gun industry has seen a spike in demand from consumers who fear new regulations could limit their ability to buy certain firearms. Is investing in guns immoral? The trend began with President Obama's re-election and has accelerated in the months since a gunman killed 20 children and six adults at the Sandy Hook school in Newtown, Conn., last December. Obama has made gun control a top priority for his second term. 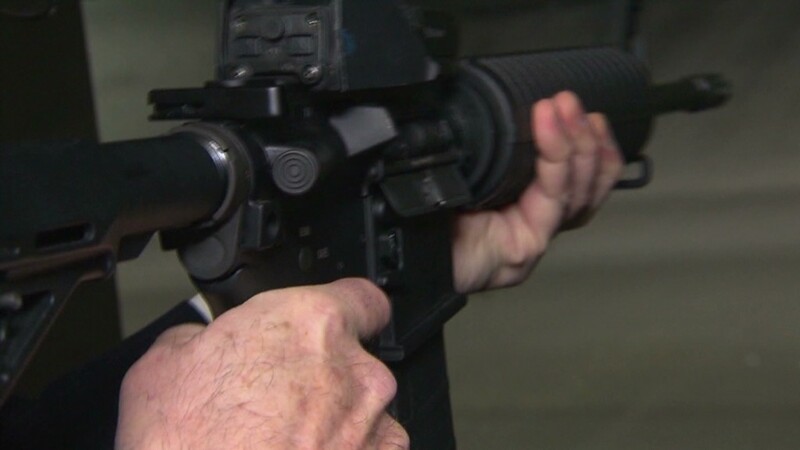 That raises the possibility of renewing a ban on assault rifles and high-capacity magazines, both of which have been used in recent mass shootings. Debney addressed the massacre in a conference call with analysts, saying, those at Smith & Wesson "were shocked and deeply saddened by the tragedy at Sandy Hook." He said the gun industry "is part of important national discussion about how to cope with violence in our communities." While he would not speculate on the political outcome, Debney said, "We will remain strong supporters of and defenders of the Constitution and the Second Amendment." Meanwhile, the company has a significant financial interest in the debate over gun laws. A ban on assault rifles could impact Smith & Wesson's earnings by up to 40 cents per share, according to Wedbush Securities analyst Rommel Dionisio. Dionisio estimates that such a ban would cut sales of the company's Military & Police line of tactical rifles, which currently account for 20% of overall sales, to nearly zero. In addition, a ban on high-capacity magazines would "severely hamper" sales of certain Smith & Wesson pistols, according to Dionisio. Given this risk and the possibility that gun demand slows down, Dionisio maintains a "neutral" rating on the stock and a price target of $9 per share for Smith & Wesson. That's 12% lower than where the stock closed on Tuesday. There may already be signs the recent frenzy of gun buying has peaked. The number of FBI background checks filed for gun permits, considered a leading indicator for sales, rose only 29% in February, according to historically adjusted data from the National Shooting Sports Foundation. That compares with a 94% surge in January and a 58% increase in February. But the more modest increase in background checks during February may have been due to the fact that retailers have been unable to meet demand, notes Cai von Rumohr, an analyst at Cowen and Company. In a report published Tuesday, von Rumohr wrote that checks with gun retailers in five different locations across the nation showed that demand has far outstripped supply. 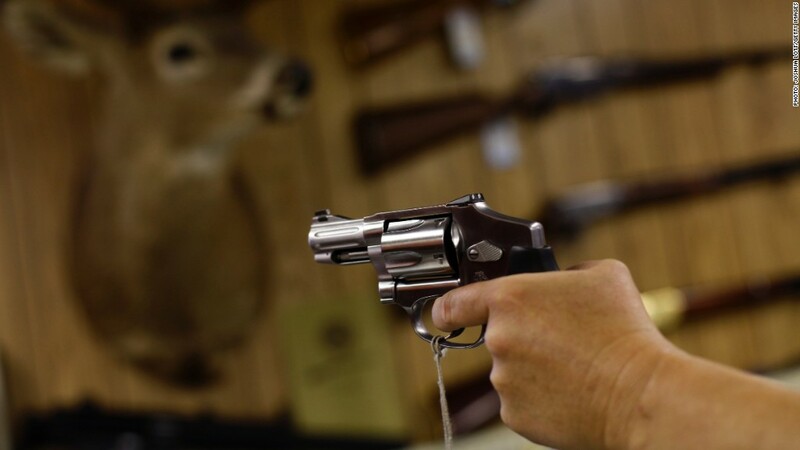 This suggests that gun sales and background checks in February "were restrained by severe shortages of inventory at retail rather than waning demand," von Rumohr wrote.